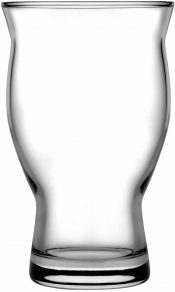 Beer Drinking Glasses- Grand Pilsner. 10 to 20 oz. Customized. Pilsners never look better than when served in a tall, frosty glass- just like our Grand Pilsner model. These come 36 per case and are available in 4 sizes- 10, 12,, 16 and 20 ounces, so you can use them for all your drafts. Work with us to create a custom logo, if you don't already have one- and then get it engraved, etched or silk screened on your glassware.